Providing healthy options at team meetings is a great first step to creating an environment conducive to healthy behaviors. Having nutritious meal options at the office can also influence employees to begin to think about how they can incorporate meal alternatives in their personal lives. Below is a list of meal items that can help you determine how to swap or alter traditional meal offerings at your next team gathering. Have water available. Adding fresh citrus and cucumber slices can make the water more appealing to your employees. Beware of fruit juices. It can contain the same amount of sugar as a soft drink. Be sure to avoid “cocktail” titles and always check the ingredient list on the nutrition label for added sugars. Provide unsweetened tea and coffee. Offer skim milk, 1 % milk, or non-dairy creamer verses half and half. Offer fresh fruit such as bananas, apples, grapes, and sliced oranges. These options are also budget friendly. Have a make-your-own yogurt parfait bar with low-fat or Greek yogurt. Topping options could include sliced nuts, low-sugar granola, or fruit. Swap pastry items for whole wheat toast and assorted nut butters and jams with no sugar added. Utilize local restaurants that offer low-calorie options. An example for an easy on-site lunch could be whole-grain tortillas with lean deli meat such as turkey and plenty of options for vegetable toppings. Serve salads with dressing on the side. Oil-based salad dressings are a good source of healthy fat. Provide broth-based soup as a low-calorie appetizer or side item. Offer baked potato chips in place of regular chips, or better yet, fresh fruit. Offer hummus paired with vegetables such as sweet peppers, cucumbers, or carrots. Provide whole-grain crackers and peanut butter as a filling and fiber-rich option. Set out a bowl or tray of ice and display low-fat and Greek yogurt options. Allow employees to grab and go as needed with a fresh fruit bowl. Create a make-your-own-mix station with air-popped popcorn, dried cranberries or other fruit, various nuts, , and dark chocolate. This will give the employee a chance to customize their dessert. Providing fresh fruit, such as sweet berries or cherries, can be a great healthy alternative to traditional desserts. 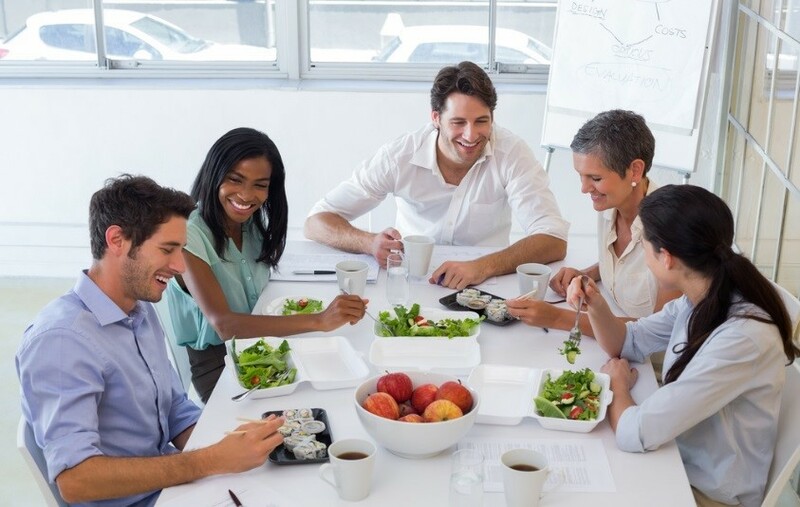 Are you already using a healthy meal strategy in your workplace? Share some of your ideas and successes.